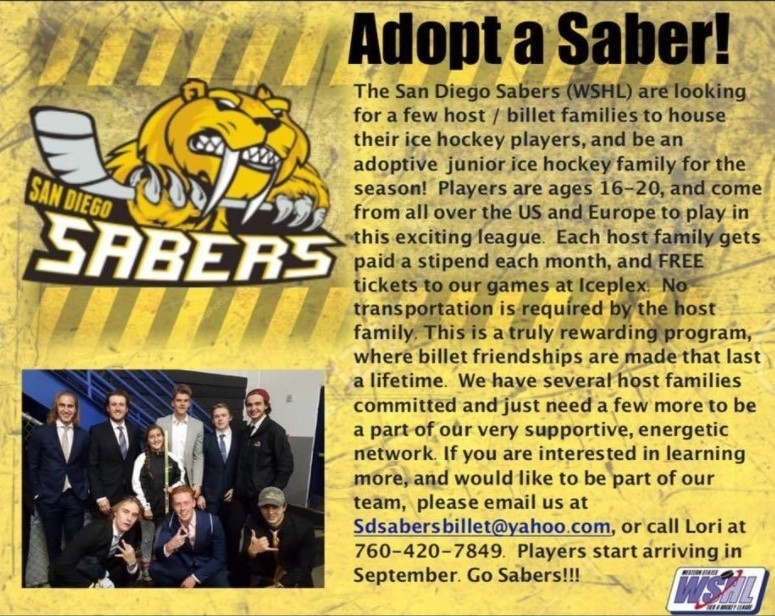 Becoming a host family for a San Diego Sabers hockey player is a great way to get involved in the community, as well as develop some very special bonds with the players and their families. For many of the players, this will be their first time away from home and they will need a stable living environment for their move to Southern California. Players on the San Diego Sabers are between the ages of 16 and 20 with the majority of them being 18 and 19 years old. Part of our commitment to our players and their parents is to help provide them with a good home. The players often become just like one of the family. It doesn’t happen all the time – sometimes things just don’t click – but it happens the majority of the time. These boys come into your lives at an early, impressionable age and leave as young men. Their time with the billet family is a very important time of their lives. They are away from their friends and family, so their billets become their surrogate family. The players arrive from all over the United States in late August to begin the season and will be here until the end of the hockey season in mid March or until the end of the post-season. At Christmas, they usually have 7-10 days off to go home and spend time with their families. Generally, billets, players and the player’s family develop very special bonds and remain close long after the player has left the San Diego Sabers Hockey Club.